My Uncle Jack recently died and we congregated in Florida, where he lived, for a memorial. Jack spent most of his years in Alaska where he was a firefighter, smoke jumper, cold water rescue diver, and father, husband. This is how I eulogized him. We approach an age, reach a time in our lives, when we count the years to come as much as years passed, contemplating aim and conviction and, through this, we learn of our honest and true dedications in life, where our love is housed, where our “here-ness” and our “after-ness” meet and that brings us clarity, though, too, rooted in this clarity is a tincture of hesitation and burden. We feel this burden because of our adulation for those we love, the hopes we have for them. Our expectations live in our imaginations because the vision, the desires that we hold close for the people we care for is drawn from a learned awareness of a kind of perfection based our own experiences, those things we did right and those we did wrong. 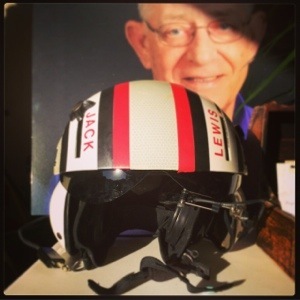 We all knew Jack Lewis in different ways—husband, grandfather, son, brother, uncle, friend. He knew us as a collective, simply as those he loved. And that love was relayed through his pride and his selflessness, his discipline and joyousness of community. We were the ones he felt responsibility for. We were his concern, where his dedication lied, where his love was housed. There is certainty and finality in death. But just as certain, just as final, is the love Jack had for his family and friends. This love that he gave us, we ought to remember, isn’t a gift without task. We now hold the bag, we now have the obligation keep the spirit of his love ever-present. We do this in how we treat each other, today and every successive day. It’s a gift of legacy, it’s a gift we have to reflect on, and mostly, a gift we have to share.